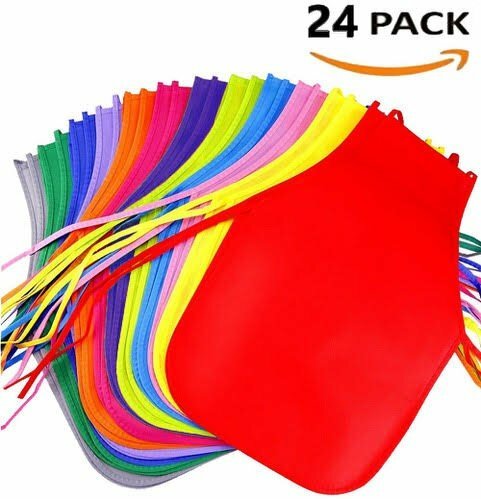 Piper Dreams 24 Piece Bulk Pack of Kids Aprons - Perfect for Painting, Baking or other DIY Projects - 12 Fun Colors - Children Love Them - Great for Boys and Girls Ages 3 to 8 by Piper Dreams at Love and Learn Preschool. Hurry! Limited time offer. Offer valid only while supplies last. 12 Different Colors (2 of each color) Bonus New Color - Grape! Reusable - Durable Material and Quality Stitching Allows you to Use, Use and Use again. If you have any questions about this product by Piper Dreams, contact us by completing and submitting the form below. If you are looking for a specif part number, please include it with your message.